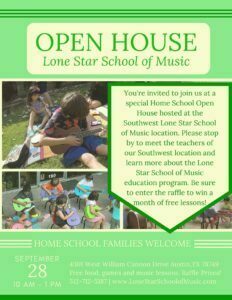 Home School students and families are invited to attend a special Home School Open House hosted at the Southwest Lone Star School of Music location. Please stop by to meet the teachers of our Southwest Lone Star School of Music location and learn more about the Lone Star School of Music. Enter our raffle to win several prizes including a month of free lessons!